Enhance your arm with the blossoming beauty and uniqueness that is unabashedly Moschino Cheap and Chic™! 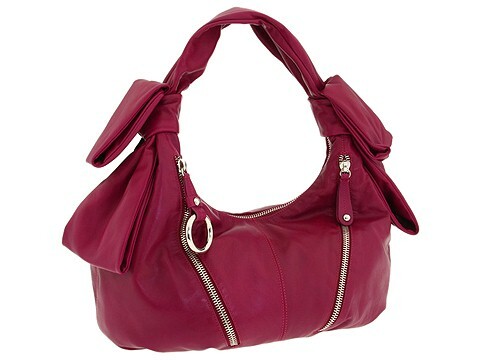 Hobo style shoulder bag made of smooth leather. Holds your wallet, lipstick, sunglasses, personal technology and a small cosmetic case. Dimensions: 15 wide across bottom, 18 wide across center, 18 wide across top x 11 deep x 10 high. Single shoulder strap with leather bow accents. Shoulder drop: 11 length. Two front exterior zip pockets. O-ring details. Platform bottom. Top zip closure. Colorful interior lining with a back wall zip pocket.